Get all the benefits of state-of the-art features in a compact, hand-held unit. Become a “speed reader” with this accurate, rugged portable Clamshell Densitometer. It has today’s most-wanted features for “go-anywhere” quality control testing...from darkroom to darkroom, and from lab to field. It’s easy to use. Just lift the “shell” and insert the test film; close the “shell” and press the READ button. The measured optical density appears on the three-digit liquid crystal display. The self-contained light source makes it convenient to use...anywhere. A carrying/storage case and a calibrated five-step density tablet are included. This compact, precision instrument is ideal for maintaining consistent, high quality film processing. By evaluating control films on a daily basis, the technologist can identify processor variations before they affect clinical radiographs. Also, processing conditions in multiprocessor departments may be standardized. In the past, this was difficult in departments using varied film-screen combinations in different areas. With this sensitometer, proper exposure of either blue- or green sensitive x-ray film is easily accomplished, with no need for internal adjustments. 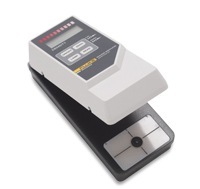 The Hand-Held Dual-Color Sensitometer features a 21-step density wedge with 0.15 OD increments. The 21density gradient steps are numbered for convenience. An innovative, dual-color, electroluminescent light source provides precisely controlled repeatable exposures. The desired color is selected with a front panel switch. To make an exposure, the platen is raised and a sheet of film is inserted beneath it until the film stops are reached. The platen is lowered and the exposure switch is depressed. An audible buzzer is activated during the exposure. To prevent double exposures, a two-second delay is engaged before the next exposure can be made. When battery replacement becomes necessary, the unit will not expose film. Battery life is approximately 10,000 exposures. Processor variations are monitored by comparing the control film to previously processed films. Speed, contrast, and base-plus-fog values can be graphically plotted for easier comparison.